People visit China to experience the history of Beijing – to visit the Forbidden City and to step foot on the Great Wall but the real secret to learning about Ancient China begins in present day Xi’an and its surrounding areas. The Capital of Shaanxi province in Northwest China, Xi’an is considered the great ancient capital of China. The Silk Road originated here, as did the dynasties of Zhou, Qin, Han, Sui and Tang. In more recent times, Xi’an celebrated the 40th anniversary of the discovery of the terracotta warriors or the Terracotta Army of Emperor Qin Shi Huang and that’s why I am here, to see firsthand the spectacular work of the local Chinese artisans some 2,000 years ago. The first emperor of China from 221-206 BC, Qin Si Huang, unified China, standardized weights and measures and developed the character writing system used today. In addition to ordering his people to work as laborers and soldiers to build his many palaces and city buildings, Qin also instructed artisans and local workers to build an army of terracotta warriors to guard his tomb in the afterlife. He died at age 21 likely from mercury poisoning, which is somewhat ironic because he surrounded himself with Mercury “rivers” as a way of protecting himself in death. In 1974, farmers digging a water well unearthed the discovery of a lifetime. It’s hard to imagine these men working long days in the field and then tapping into bronze arrowheads and color painted clay soldiers. Before the government learned of their find and archeologist sent to investigate, farmers even sold some of the precious relics to make money. It must have been quite an undertaking for archeologists to preserve these treasures. 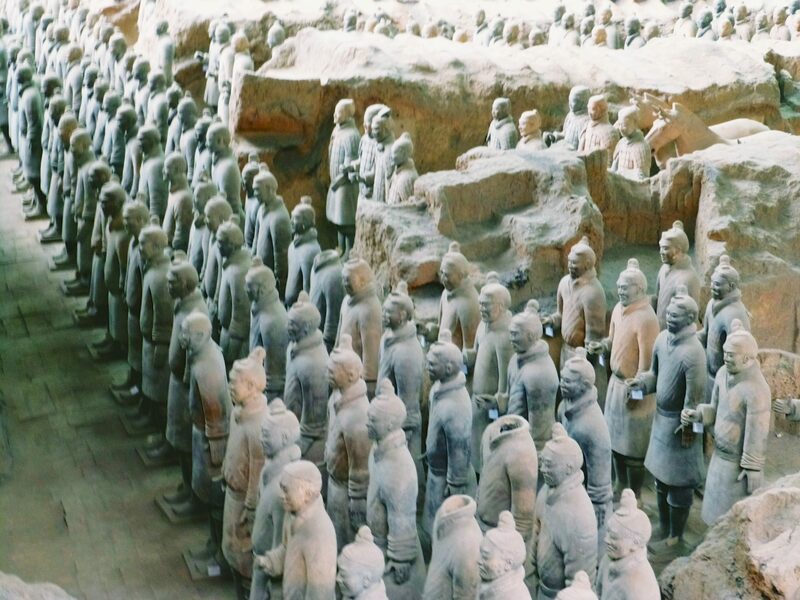 There are an estimated 8,000 terracotta soldiers: 6,000 in the first pit; 2,000 in the second pit; and 68 in the third pit. Experts believe there was a fourth pit that probably never came to fruition because of the untimely death of Emperor Qin Si Huang. It is believed it took 700,000 people working together to complete the army. Resembling a real standing army, these clay soldiers were lined up according to rank. Envision rows of life-like cavalrymen, infantrymen, low ranking to high-ranking hunkered in ditches ready for war. There were archers and horses with carriages, even acrobats and entertainers all found outside the city wall of Qin Si Huang’s tomb. Qin’s tomb sits at the base of the Li Mountains where he built his traveling palace. It was a mountain rich with jade and gold – perfect for an emperor’s resting place. It must be noted that each clay “soldier” looks significantly different. Prior to being exposed to oxygen during the excavation process, the soldiers were painted a a brownish-orange color with white face and colored armor. The detail in their faces is incredible. One soldier may have a mustache or other facial expression, while the soldier next to him nothing. They are truly exact replicas of human soldiers. At some point, it’s likely the area was looted shortly after Qin’s death and the area set on fire, which allowed the rafters to essentially bury the soldiers in time. It’s overwhelming to see what these people created in 221 BC and with such unbelievable precision and detail. Many of the pits have been sealed off at this time until scientists can figure out how ways to better preserve the soldiers. Xi’an’s population is about 8.4 million people. In a country with 1.4 billion, it’s relatively small. HA! Understandably, the terracotta warriors are the big draw in Xi’an but it’s also worth catching a glimpse of the ancient city wall that encloses the city. Constructed by the Ming dynasty in 1370, the current wall remains intact today. It’s about 8 miles around and 40 feet high. In ancient times, a moat and drawbridge warded off invaders. 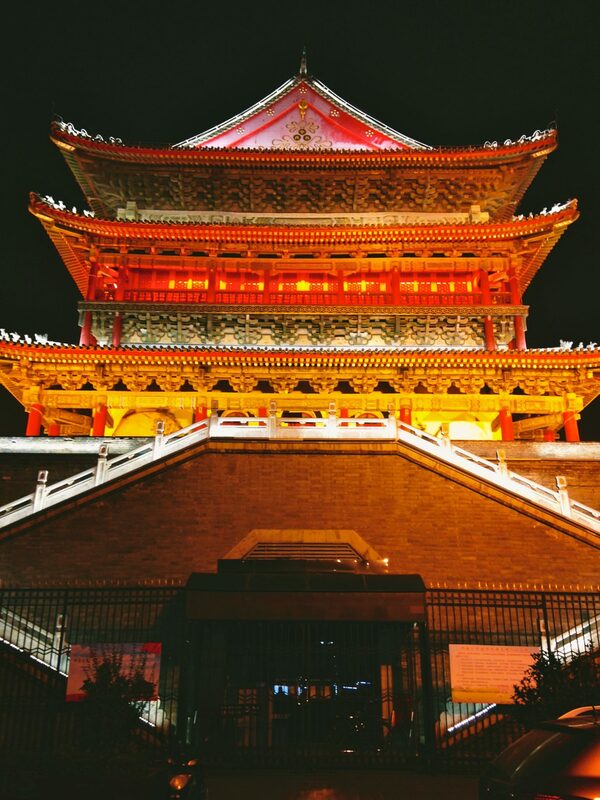 It’s stunningly beautiful and most of the businesses in Xi’an remain located within the walls. A bell tower sits on the east side and the drum tower nearby to the west. The people would ring the bell to announce the sunrise and beat the drum to declare the end of the day and sunset. Xi’an is also home to one of China’s largest Muslim population. There are an estimated 50,000 Muslims living in Xi’an, which was the first city introduced to Islam. Emperor Gaozong of the Tang Dynasty officially allowed the practice of Islam in 651 AD. I visited the Muslim Quarter at “sunset” (I’ve yet to see the sun) and it’s as if people came out of the woodwork. Food vendors lined street after street of narrow alleyways. I don’t know what I was expecting but the Muslims in China resemble Chinese people not Middle Eastern. The women cover their hair but only with a light scarf. Similarly, the men wear a type of white cap but the rest of their attire is jeans, tops etc. I sampled my way through the Muslim Quarter tasting an ear of corn (a local specialty), a type of banana rice sponge cake dipped in vinegar and lastly a rice dumpling loaded with jelly. My blonde hair is not helping me here with the pictures. I tried to take a selfie in front of the drum tower while eating my sponge caked and it fell off the stick. The eyewitnesses giggled until finally after watching my demise, a local took pity on me and snapped a picture. Visiting the Muslim quarter is like diving into a shoppers anonymous course. If I slowed to take a peak at any merchandise, an army of shop owners crowded my space yelling, “real pashmina, real jade” and I felt compelled to pay attention to their presentation before declining. In Xi’an, I also finally found the pollution everyone talks about in China. It’s like an umbrella of haze hovering over the city. I feel trapped in a bubble, as I can’t see above most building tops and it’s as if the sky is one giant continuous cloud of gray. When the sun peaks through, it reminds me a bit of light bright from my childhood days. Why is the pollution so bad? It’s easy to understand. Here in Xi’an it’s the factories and the coal used for heating. It’s about 40F degrees here and it turns quite cold so it’s necessary to heat the homes and buildings. With automobile, aircraft and textile factories dotting the landscape, it’s obvious it creates poor air quality. I’m surprised most people aren’t wearing masks. It doesn’t bother me at all to breathe. I just wish I could see the skyline but give me a mask for the bathrooms!